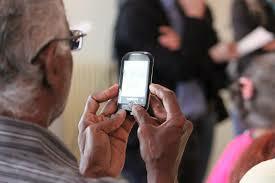 Research is showing that people over 65 are often digitally suboptimal. They are sociologically vulnerable, frequently being lonely, isolated and angry at feeling abandoned. And studies show they are far more susceptible to fake news, misinformation and financial scams. It’s late morning and roughly 25 senior citizens are learning how to talk to Siri. They pick up their iPads and press the home button, and pings echo around the room as Siri asks what she can do to help. “Siri, what’s the closest coffee shop?” one woman asks. “Sorry I’m having trouble with the connection, please try again?” Siri says. A handful of employees with AARP, the national nonprofit focused on Americans age 50 and older, hover behind the participants and jump in to help. They’re in Fort Washington, Maryland, to deliver four free workshops about how to use an iPad. Participants learn how to turn it on, what an app is, how to text, and how to flip the camera to take a selfie, among other activities. It’s a comforting message, but the reality is more urgent. Although many older Americans have, like the rest of us, embraced the tools and playthings of the technology industry, a growing body of research shows they have disproportionately fallen prey to the dangers of internet misinformation and risk being further polarized by their online habits. While that matters much to them, it’s also a massive challenge for society given the outsize role older generations play in civic life, and demographic changes that are increasing their power and influence. People 65 and older will soon make up the largest single age group in the United States, and will remain that way for decades to come, according to the US Census. This massive demographic shift is occurring when this age group is moving online and onto Facebook in droves, deeply struggling with digital literacy, and being targeted by a wide range of online bad actors who try to feed them fake news, infect their devices with malware, and steal their money in scams. Yet older people are largely being left out of what has become something of a golden age for digital literacy efforts.Since the 2016 election, funding for digital literacy programs has skyrocketed. Apple just announced a major donation to the News Literacy Project and two related initiatives, and Facebook partners with similar organizations. But they primarily focus on younger demographics, even as the next presidential election grows closer. This means the very people who struggle the most with digital information and technology risk being left to fend for themselves in an environment where they’re being targeted and exploited precisely because of their vulnerabilities. Older people are also more likely to vote and to be politically active in other ways, such as making political contributions. They are wealthier and therefore wield tremendous economic power and all of the influence that comes with it. With more and more older people going online, and future 65-plus generations already there, the online behavior of older people, as well as their rising power, is incredibly important — yet often ignored. Kevin Munger, a political scientist who studies the online habits of older Americans and their effect on politics, painted a stark image of the reality for many older Americans and their relationship with the internet. The present and future of what the internet and social media look like with a massive population of extremely online seniors is unknown. But what’s clear is older Americans will become even more of an online force to be reckoned with — and no one is really sure what that will look like, or how to prepare for it. Munger said the culture and content of the internet have historically been determined by an equation that roughly works out to the people who have access multiplied by those who have the most time to spend on it. “In the next decade, it’s going to become way more old people,” he said. “Older people are the forgotten generation — that’s why it’s important for us to learn stuff like this,” says Joshua Rascoe, 70, after the first AARP workshop wraps up. Rascoe says he’s retired but spends time working with kids to teach them how to start a small business mowing lawns in order to save money and get ahead. He used Facebook for a previous business but said he’s wary of social media. “I know how to Facebook and I know how to go to Instagram,” he says. But he needs to learn more because, his impression is, “about 80% of it is fake.” Rascoe just isn’t sure how to navigate around it. As the day goes on, there are many aha moments in the room. A first selfie. The first time texting a photo. By the end, participants are ready to go online and try things. And that’s when they become targets, particularly on Facebook, which has seen massive growth in the number of older Americans joining the platform since 2011, according to data from Gallup. If there’s a sucker for fake news on Facebook, it’s easy to find them and feed them more. “We did target older age groups when running ads, and I'm sure you will find the same with hyperpartisan publishers,” he said. Coler’s firsthand experience is borne out by study after study, and not just when it comes to Facebook. Research published in January found that “On average, users over 65 [on Facebook] shared nearly seven times as many articles from fake news domains as the youngest age group.” Similar findings have come from studies looking at the spread of false information on Twitter and at web browsing in general around the 2016 election. “People over 60 or 65 seem to be especially prone to consuming and sharing fake news and online misinformation more generally,” Brendan Nyhan, a political science professor at the University of Michigan and a coauthor of one of the studies, told BuzzFeed News. As Coler noted, boomers are also big consumers of content from hyperpartisan political Facebook pages, which drive huge engagement on the platform by stoking partisan passion via memes and articles. Nicole Hickman James spent years working for a publisher that ran both liberal and conservative hyperpartisan Facebook pages and associated websites. She says over time she tailored her articles to older readers because they were the most engaged audience. James said a lot of the people who regularly commented on her stories on Facebook or reached out to her were older. When she would occasionally pitch in to help run her employer’s hyperpartisan conservative Facebook pages, she saw the same thing. “The commenters were the same, just on the other side of the aisle. Older, very partisan, etc. And the conservative engagement was always much higher,” she said in a Twitter direct message. Progressive activist Jordan Uhl highlighted this in February when he tweeted a series of screenshots showing the demographic data for Turning Point’s ads. The Facebook ad archive shows that after Uhl’s viral tweets, Turning Point’s ads changed and began reaching young people, as one would expect for a student-focused group. Turning Point did not respond to a request for comment, but it seems the organization initially used criteria other than age to target its ads — and boomers just happened to be the most receptive demographic. That’s also the case for Ami Horowitz, a conservative filmmaker who produces short video segments for Fox News and often appears as a guest. He’s been running multiple versions of an ad asking people to “LIKE if you agree” that the US needs to stop illegal immigration. The versions viewed by BuzzFeed News in the Facebook ad archive primarily reached people older than 55, with those over 65 being the largest portion of audience. “I do not target any ages,” Horowitz told BuzzFeed News in a Facebook message. At least three of the pages she liked were run by the Russian trolls at the Internet Research Agency, and at least one is a fake conservative page run by a self-described liberal troll who targets conservatives with false stories and memes. Cameron Hickey, her grandson, was a producer for the PBS series and noticed his grandmother’s liking and sharing habits when analyzing hyperpartisan Facebook pages for the show. When discussing her Facebook usage with BuzzFeed News, he mentioned that she had recently shared a meme from the fake conservative page, even though he’s tried to help her better navigate Facebook. That sense of frustration mixed with love and a tinge of guilt is familiar to many people. But there’s also a rising strain of resentment and anger being expressed publicly (often on Twitter by media insiders) toward boomers and Facebook, and what the two together have wrought.“My current understanding of Facebook is that it's the place everyone goes out of necessity for news from the handful of groups they follow, and a handful of mostly boomers go to redpill themselves into believing utter nonsense,” tweeted Christopher Mims, a technology columnist for the Wall Street Journal. “The evolution of Facebook from the hip thing Obamaites used to target young suckers into the scary thing Russians used to target old suckers has been fascinating to live through,” tweeted Sonny Bunch, executive editor of the Washington Free Beacon. These sentiments are likely a byproduct of the fact that our current chaotic information environment is creating a historic gulf in the media habits between generations. People 25 and younger are heavy users of platforms such as Snapchat and Instagram and barely watch any traditional TV. Older Americans are more likely to use Facebook and watch traditional TV. People of all ages in the US are on Facebook, but younger people use it far less, and often cite the fact that their parents and grandparents are there as a reason to stay away. But even with a growing amount of data showing how much older Americans struggle with digital literacy, it’s unfair to point the finger at one age group as the cause of informational rot on the internet, according to Andy Guess, an assistant professor of politics and public affairs at Princeton University, and the coauthor of a recent study about fake news consumption.“It’s really easy to latch onto an explanation like that. And if it seems to really resonate with your experiences, that’s when you should stop and think, What am I missing?” he said. Generational resentment also further isolates boomers, which compounds the problem. “Seems like I see a lot of loneliness,” James said of the commenters she interacted with on liberal and conservative hyperpartisan Facebook pages. Feelings of isolation and loneliness are important factors in the online behavior of older people. In their Scientific American article, Ghosh and Iyengar cited research that found loneliness can affect cognitive functions and physical and mental health, and can result in a decline in the ability to self-regulate. Feelings of isolation and loneliness are important factors in the online behavior of older people. “This constellation of behaviors, which broadly seeks to avoid conflict and minimize disappointment, may make these individuals prone to gravitating towards sources of information that mirror their own worldview thereby maintaining a sense of self,” they write. That translates into online habits that could cause older people to unwittingly construct filter bubbles as they seek out contact and reinforcement for their worldview. It may also make them more vulnerable to elder scams and fraud, which have become an epidemic. “Crimes against the elderly target some of the most vulnerable people in our society,” Attorney General Bill Barr said. Steve Baker worked for the Federal Trade Commission for more than 30 years, specializing in investigating fraud and scams. He told BuzzFeed News that the Jamaican lottery fraud, which involves telling someone they won a cash prize and then asking them to pay a fee to collect it, specifically targets older people. “With the Jamaican fraud, we know they’re not only getting tons of older people but they’re looking for older people to target,” he said. Baker, who now runs a website and newsletter about frauds targeting older consumers, also said it’s common for older adults who’ve been scammed to genuinely not realize they’ve been ripped off, which makes it even easier on the crooks. The DOJ announcement noted that it recently helped organize the first Rural and Tribal Elder Justice Summit in Iowa to help combat elder abuse and economic exploitation in these communities. Older Americans are more likely to live in rural communities and this can bring with it a sense of isolation that makes the internet seem like the best, or perhaps only, way to connect with others. There is also another, delicate issue regarding older people and their interactions with digital information and technology. It’s something no one wants to talk about directly, least of all with their relatives, but it’s a reality of aging: cognitive decline. We are all susceptible to it, and it can come on suddenly or creep up over years. But once it has taken hold, it can drastically affect how you interact with the world. “It’s sad and potentially very dangerous,” he said. Even boomers who have experience with computers and technology find themselves feeling a bit left behind. At the AARP workshop, Charles Robinson, 75, stood with his cane proudly wearing a Veterans of Foreign Wars hat. He took his iPhone out of his pocket and said he does everything on it, from paying bills to email. As he was speaking to a reporter, a text message arrived from this grandson asking whether Robinson had managed to get his home computer back up and running. He hadn’t, and the instructions sent by his grandson didn’t help. He and his wife, Jan (who winkingly gave her age as “70-plus”), are retired and have spent recent years traveling. They have college degrees and remain engaged in the world around them. But using technology is more of a struggle for them than it used to be. “We both worked in the government and went to college, but the technology is still moving on no matter how many degrees you got, so we got to keep up with it somehow,” she said, noting that she was happy to have learned how to crop a photo. “Years back when the computers came out, we were more savvy.”Of course, those currently over 65 didn’t grow up using the internet or spend a large portion of their lives with it. But it will be different for people who will turn 65 in another 20 years, right? “The rate of change on the internet is going to increase, and the extent to which we have people in their mid-twenties who already feel alienated from people in their teens who experience the internet differently is only going to become more serious unless the internet itself stops changing so quickly,” he said. An avid Facebooker in their forties may already be puzzled by TikTok, for example. And so it’s possible that today’s internet-savvy adults become tomorrow’s struggling seniors. That means the question of how to help older people adapt to the internet and new digital environment isn’t just about supporting today’s seniors. Solutions have to anticipate and meet the digital literacy needs of the 65-pluses of the future. That’s difficult given that as of today, older people are largely left out of the digital literacy boom, and often struggle to get family members to help them. “We have a childproof internet, so the solution might well be a senior-proof internet. But the point is, this won’t work because the seniors vote a lot and they do not want to be told what to do at all,” he says. They also may not be interested in digital literacy classes if they aren’t framed properly. Coler, the former fake news publisher, said a senior center in his California town recently tried to hold a "Tips for Spotting Fake News" workshop. It was canceled due to a lack of interest. “I think naming the class ‘Tips for Spotting Fake News’ was poorly planned—everyone thinks THEY can spot fake news, just not others,” he said in a Twitter direct message. Munger says the starting point is to recognize that older people are justified in feeling they’re not being given proper support and understanding, and to meet them on their terms. That could mean more offerings like AARP’s workshops in a wide variety of areas, but also more research to understand how aging, social media, technology, and society intersect.